I come back to you after the summer break to present a word premiere. A short personal interview with the Truss project manager was recorded video during my last visit to Dublin and now it has just seen the light! Hello, my name is Alberto Gonzalez, I am from Spain and currently I am an early stage researcher in ENSA in Santander. 1. What and where did you study? In 2012, I earned a double Master’s degree in Civil Engineering from both “Escuela de Caminos, Canales y Puertos” in Santander and “Ecole des Ponts et Chaussées” in Paris. After that, I worked as a project and research engineer for a subsidiary of the Vinci group. Being part of this international project is simply great. It’s the perfect environment to develop our work as we are supported by different experts from different institutions. In addition, we enjoy the best conditions to focus on our work. 3. What is your research project about? My research is focused on the seismic analysis of high density racks. 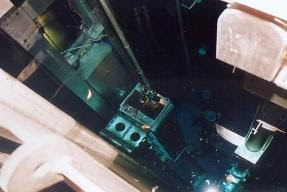 Racks are free-standing structures located on the floor of a 12m deep pool and designed to hold spent fuel removed from the nuclear power reactor. Their response face to an earthquake event is a complex issue as it mix a very highly nonlinear behaviour, a transient dynamic effect and a fluid-structure interaction. 4. How will your research contribute to society? In a first stage, we will improve the understanding of this kind of phenomenon. In a second stage, we will try to reduce the inherent uncertainty of such a specific analysis. As a result, we expect to optimise the distribution of racks inside the spent fuel pool and therefore increase the total storage capacity of the pool. 5. What would you like to do after TRUSS ITN? Honestly I really don’t know. I have some experience in industry and academia and both could match my interests. The only thing I want is to keep motivated and doing research. This month ENSA had the great pleasure to hold the TRUSS annual plenary in Santander (Spain). During this 2-days meeting, the members of the TRUSS consortium visited the ENSA’s facilities and saw 3 huge steam generators ready to be shipped to the Beaver Valley NPP. The early stage researchers, we also had the opportunity to attend a presentation of Prof. Castillo on extreme value statistics and to share the progression of our respective research. I. Hydrodynamic masses concept: inertial coupling effects of the surrounding water volume are replaced by the equivalent mass of water vibrating with each rack. The fluid is treated as a virtual extension of the structure changing its effective mass. II. Thermal analogy: If the fluid is inviscid and incompressible, its velocity field satisfies the Laplace equation (∇2Φ=0), and the associated pressure field can be determined via the Bernoulli equation. Therefore the potential flow shows a complete analogy with the steady-state heat conduction phenomena which can be used to assess the hydrodynamic masses in a cost-effective way. III. Dynamic analysis: A simplified wired model maintaining the original natural frequencies is used to perform a cost-effective full transient analysis. IV. 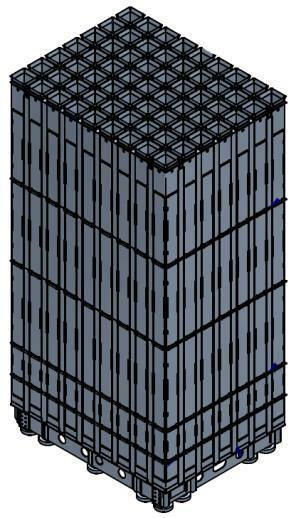 Stress analysis: Resulting loads and displacements are transferred from the dynamic model to a detailed FE model in order to check local stresses and instabilities. This knowledge will allow me to automatically generate my own series of numerical outputs. It is a basic starting point, as I count on comparing them with experimental data to evaluate the uncertainties inherent to the methodology. As part of my research project, it is expected to compare the numerical outputs obtained from a FE model with experimental data collected from a physical model test. This scheme is called to be the best weapon to evaluate the uncertainties inherent to the current analysis methodology. Such a physical model is be able to test different configurations in terms of clearance, fuel loading, ground accelerations, friction coefficients, etc. In addition, it allows to simultaneously testing more than one rack. This approach represents a big progress in relation to the up to date experiences outlined in the previous post, since here we evolve from a 1-rack to a 2-rack model. This upgrade will definitely take into account the coupling forces interacting between 2 free-standing racks. Scale 1/1 in densities due to the difficulties in scaling water density. Scale 1/1 in accelerations due to the difficulties in scaling the gravity. Scale 1/3 in geometrical dimensions due to the space and weight limitations. The second step involves the structural design of the steel frame, the vibration table and the water pool. They should represent the features of the real ground location and therefore be infinitely stiff and undeformable. However, it would result too expensive so we just focused to avoid resonant amplification effects. To do so, a modal analysis of the whole vibration system was performed to assess the natural vibration frequencies and local stiffness were corrected where necessary. In a final step, the dynamic analysis of the mocked racks was performed following the ENSA methodology. Maximum sliding displacement and impact forces were assessed and the numerical outputs were used to check the operability of the model and set its working range preventing dangerous impacts. The physical model is still under construction but hereafter you can find a video of the preliminary alignment test. The first step is accomplished! Today, I would like to talk about the first part of my research project. Every good researcher, and here I include my TRUSS colleagues, consecrate time to refresh technical concepts and perform a literature review. Fortunately, nowadays we have internet and thousands of articles are accessible online. It makes the search for technical information much easier but, on the other hand, reading and filtering that information still takes a lot of time. You can imagine how tedious can this work be, but it is critical to get into the state of the art, become aware of your level of knowledge, discover interesting approaches and set your own path. In my case, this stage lasted for about 6 straight months due to the complexity of the topic. However, it doesn’t bother me since I truly believe that successful results only come from the right initial conditions. Just like in structural transient analysis! Even if my research topic is a very specific problem in a special domain, I have been able to find out interesting information about the different complex problems that affect the racks seismic behavior. Actually, one could spend his entire life reading about structural dynamics, fluid-structure coupling, computation algorithms, uncertainty analysis, etc. However, besides that general bibliography, there also exist some works particularly focused on the seismic behavior of racks. Since the free-standing concept has been developed quite recently, most of these articles have been written during the last 25 years. It is not surprising that this kind of research was carried out in countries where the nuclear industry is well established as USA, France and Japan. The ground-breaking authors where constrained by the computing capacity of their time, so they used rudimentary numerical 1-rack numerical models occasionally supported by real scale physical models. As a consequence, very few studies take into consideration the interaction effects between the different racks nestled in the depths of the spent fuel pool. Nevertheless, this a priori hidden interaction caused by the inertial coupling of the water volume has proved to be decisive when clearance between units is small. In other words, there is still much work to do! In the same time, I have approached the ENSA’s analysis methodology currently applied in the dynamic analysis of the nonlinear response of HDSFS racks. This cost-effective methodology considers the Fluid-Structure Interaction (FSI) through the hydrodynamic mass concept and takes advantage of the thermal analogy to perform the ensemble of calculations in unique software. It is in agreement of the international guidelines, validated by the nuclear authorities and implemented in ANSYS Mechanical thanks to the expertise of my supervisor Mr. Costas. In order to summarize all of this work, I have written two technical papers highlighting my personal conclusions. The first describes 6 sources of uncertainty in design identified to date, and the second details the current analysis methodology and provides some numerical results. They are already submitted for approval to a couple of international congress planned for this summer. I promise to keep you posted on the progress. Post 1 : Let's get started! I am Alberto GONZALEZ MERINO and this is my new blog! If you are interested in the research and development in general and the nuclear power and uncertainty analysis in particular, this is your place! You are more than welcome! Take a seat; I hope we will have a great time! First of all, I would like to briefly introduce myself. Within 2007 and 2012 I studied and earned a double Master’s degree in Civil Engineering from both “Escuela de Caminos, Canales y Puertos” in Santander and “Ecole des Ponts et Chaussées” in Paris. During this high excellence exchange program I was granted with several public and private academic achievement awards. Right after my graduation, I made the choice to start working as a research and project engineer for a small French multinational company dedicate to inventing, designing, manufacturing and installing Fusegates® worldwide. During those years I have been working in different international projects all over the 5 continents where I have acquired a useful experience in FEM structural analysis, and in stability assessments against sliding and overturning in normal, degraded and seismic conditions. Finally, I enrolled the TRUSS program in October 2015 as an Early Stage Researcher in charge of the project No.3: “Reduction of uncertainty in design of free standing nuclear spent fuel rack”. 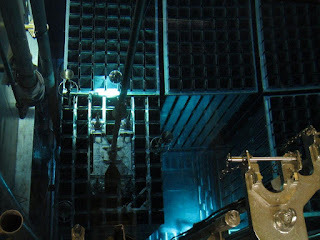 As you probably already know, Racks are used in the first step of the waste management process, during the wet storage. They are structures designed to hold nuclear spent fuel assemblies removed from the Nuclear Power Reactor after having been irradiated. Their design deals with a fluid-structure interaction problem, a transient dynamic response and a very highly nonlinear behavior. Quantifying the uncertainties in its design is a troubling safety issue for the nuclear regulatory authorities. The tricky underwater seismic response remains as complex as crucial. 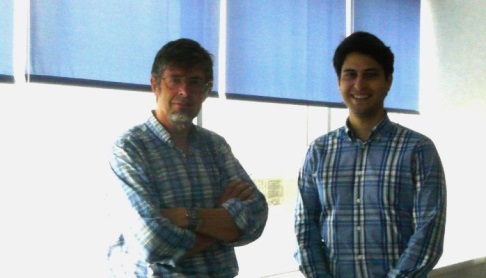 In order to achieve that goal I will be helped by M. Arturo Gonzalez from University College of Dublin and by M. Luis Costas from Equipos Nucleares (ENSA). In the following picture you can see my industrial supervisor M. Costas and me in my first day in the job. I am integrated within the Design & Analysis department of ENSA, a leader company in the Spanish nuclear field. 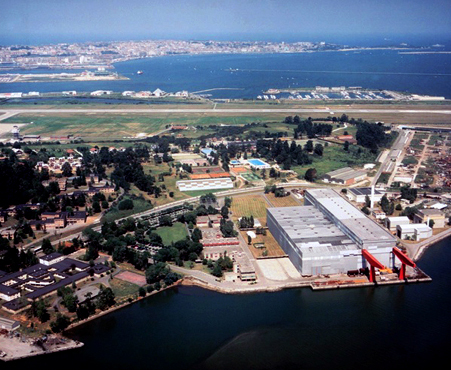 From its location in the Bay of Santander (Cantabria), they design, manufacture and supply large nuclear components for Nuclear Power Plants worldwide. In addition to racks, they have a renowned experience in reactor vessels, steam generators, heat exchangers, casks for fuel storage and transportation, etc. If you want to learn more about the quality of its products and their high-tech manufacturing processes, fell free to check out ENSA website (www.ensa.es). There, you will note their investment regarding the R+D+I activities and its Advanced Technology Center with accredited laboratories.